Do you need a legalised translation of a school report, birth certificate, criminal background check, marriage certificate, a university diploma, documentation for work or business, or any other document? 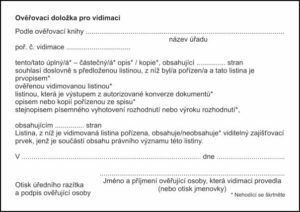 We offer translations of official documents or deeds with legalisation from Czech and to Czech. The translation will be verified by a sworn translator, appointed by one of the regional courts of the Czech Republic. A legalised translation or a translation with legalisation is a document that contains the translated text, an interpreter’s clause (written in the target language, with an official stamp, registration number from the interpreter’s journal, and his or her signature) and the original document, or its certified copy. The entire document is bound with a tricolour ribbon, stamped with an official stamp (seal) and signed by the sworn translator. Preparation of the interpreter’s clause – prepared by the sworn translator who pledges that the translated text agrees with the original. The interpreter’s clause includes a signature and stamp of the sworn translator. Can I have an identity card certified? The law does not permit legalised translations of identity cards, driving licences and passports. What is an interpreter’s clause? It is a document by which the translator provides a proof of his or her authorisation to provide legalised translations. An apostille is a clause attached to official deeds and documents to show that the signature and imprint of the stamp on the document have been verified for use abroad. Notarial offices or competent ministries can issue the apostille. What is a certified copy (vidimus)? It is a confirmation in which the notary confirms a verbatim accordance of the copy with the original. It is provided by notarial offices or at Czech POINTs. Do you have an inquiry or just a question? Write to us, we will get back to you in no time.